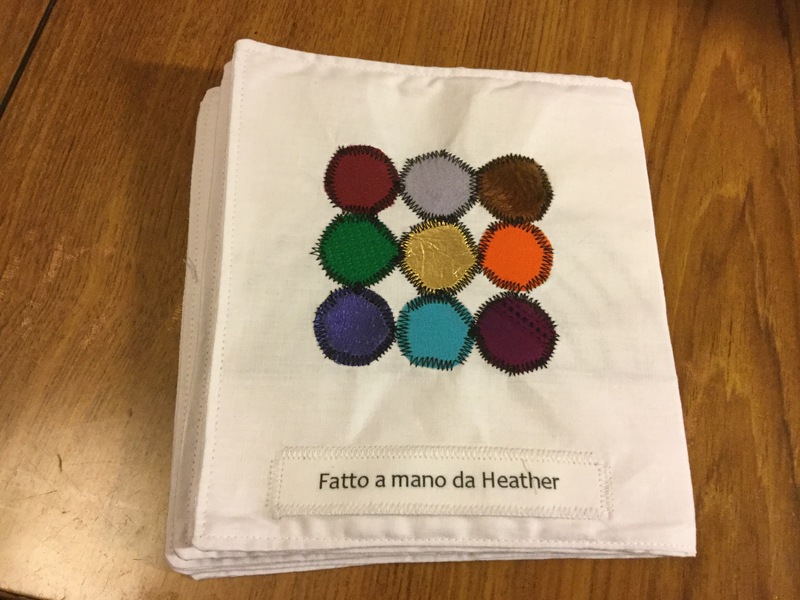 Or ‘Il Libro Arcobaleno Di Etta’. 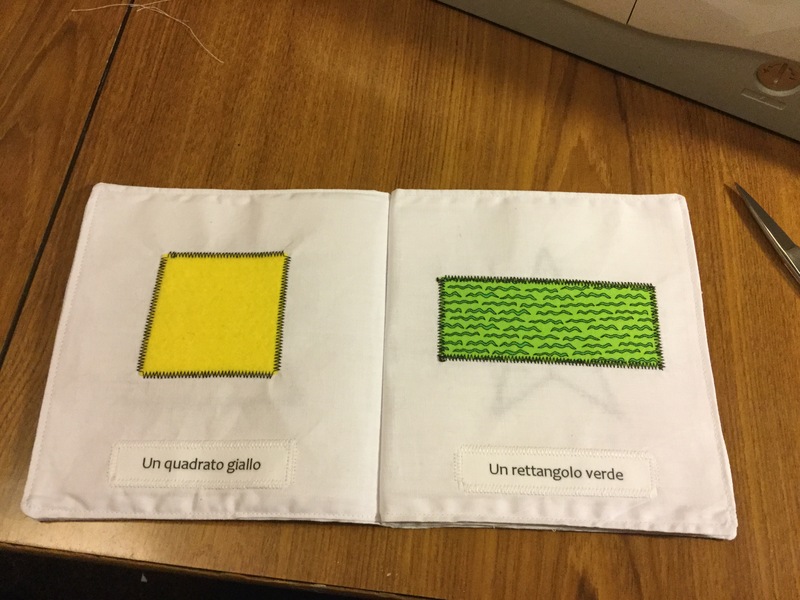 A friend of mine is half Italian, and has an 18 month old daughter, who she is teaching both English and Italian. 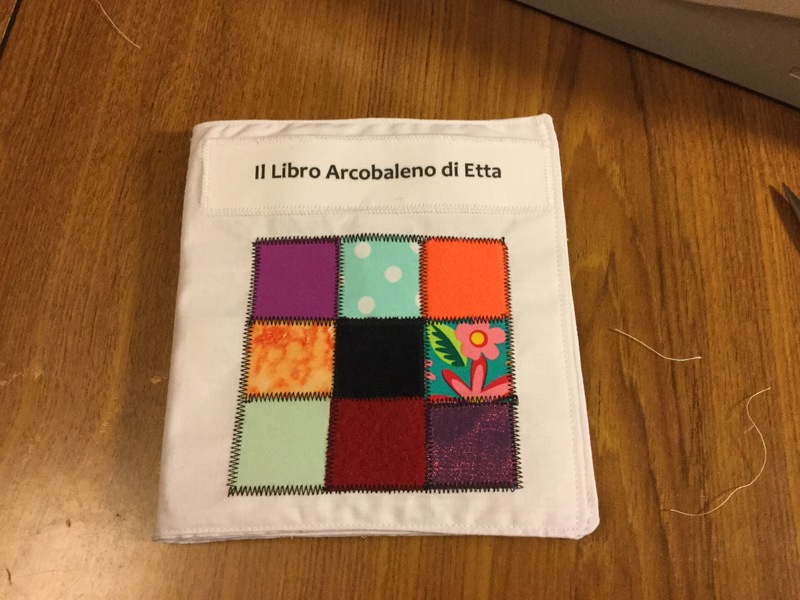 My friend was able to get quite a few Italian children’s books from the wonderful Library of Birmingham, however these were more suitable for older children, so I decided to make a fabric book for her. 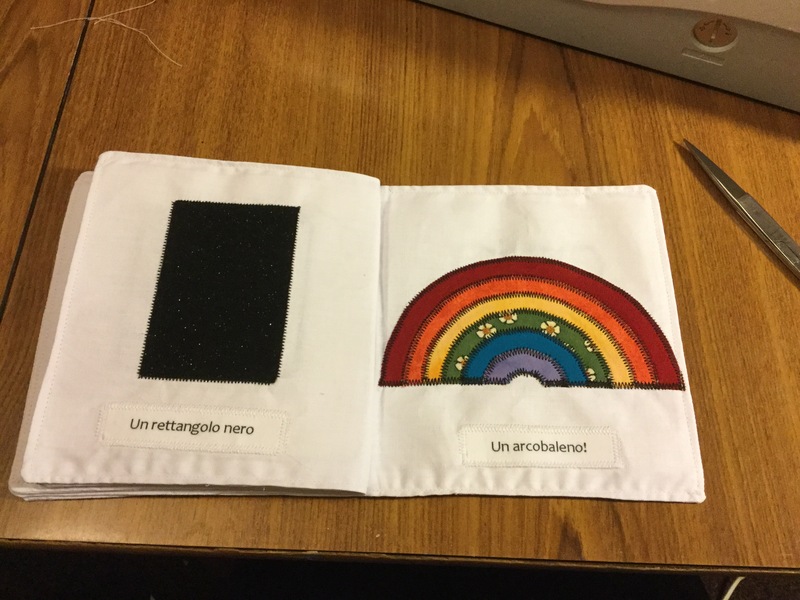 I decided on a rainbow book with colours and shapes, and another friend helped me with the translation. 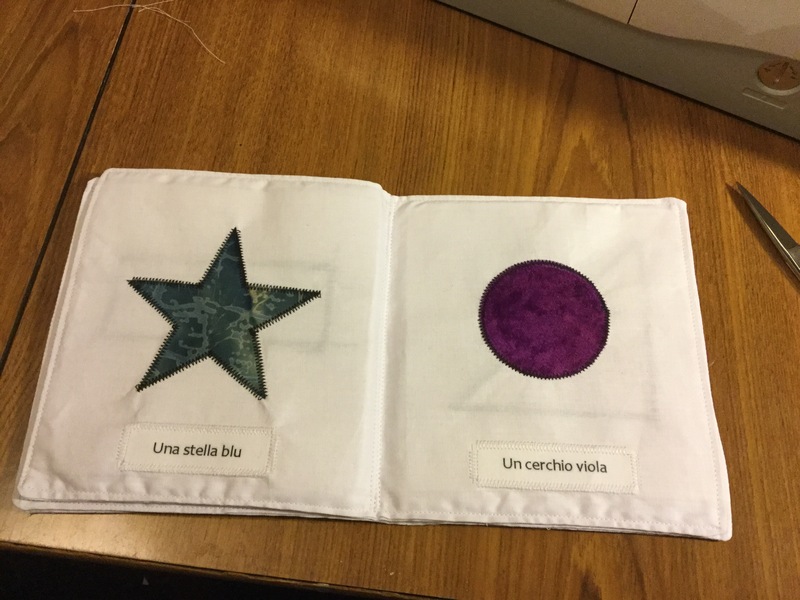 I made a paper mock up so that I would be sure to get the page contents on the right leaves of the book, picked a range of fabrics for their colour and texture. It was an opportunity to use lots of scraps of special fabrics from other projects. 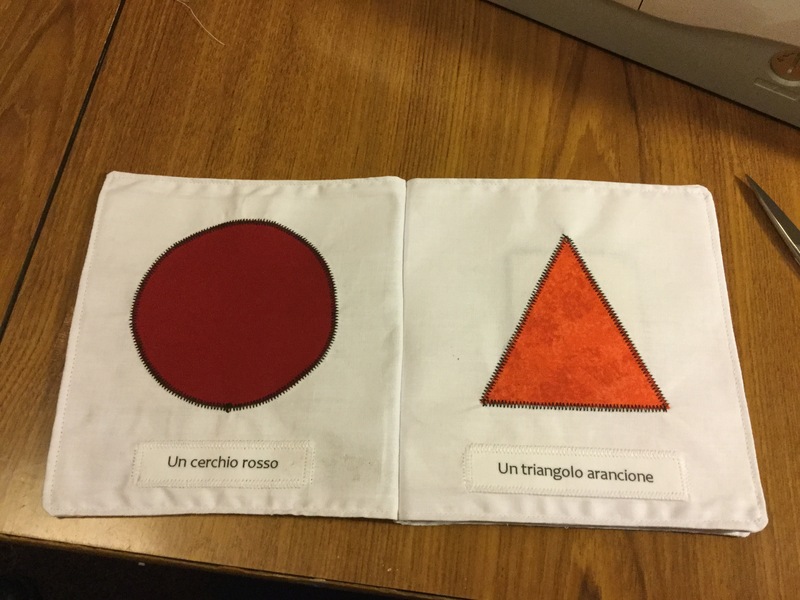 The red circle is a smooth, satin like fabric which Etta’s mum gave me, and the orange triangle is from the first quilt I made. The black rectangle is twinkly black felt from an embroidered picture my husband made me. The rainbow is layers of interesting cottons which I made by bondawebbing the arcs on top of each other, then cutting the gap out of the bottom. All the shapes are appliquéd down with black zigzag stitch, which on the rainbow meant stitching through lots of layers! The back cover is more tactile fabrics, including a fake fur, gold leather, some shirting with an interesting weave that I dyed purple, and some aida. The stitching is a bit wonky because these circles are only 1.5cm across, and stitching that tight a circle with zigzag is hard! The book was really well received – mum and dad can leave Etta with it without worrying that she will damage it, and she loves all the different textures.